Let’s rewind to E3 2009. I’m inside LucasArts’ conference room. I’m a few minutes early for the Star Wars: The Old Republic presentation. They have food and drink in both corners of the entrance. I’m told to help myself, but I can’t find anything that isn’t bloated with sugars and salt. I’m told to look around and watch a few games in action before the demonstration starts. I see a man dressed as a Stormtrooper leaning against a wall in the back center of the room. I approach him and ask if his feet hurt. Then, out of the corner of my eye, I see two demonstration kiosks. One is for Telltale Games’ Tales of Monkey Island series. The other is for Secret of Monkey Island: Special Edition. I’m floored. Shocked. Dazzled. I listen to the presenter intently, consumed by a flurry of emotion. It’s like my dog came home after leaving the family for nineteen years. It’s amazing, one of those “I saw God’s face” kind of experiences. And it’s finally here. 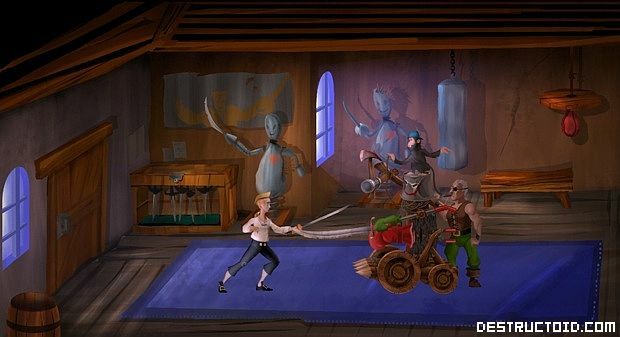 On Wednesday morning, LucasArts’ Secret of Monkey Island: Special Edition released on Xbox LIVE Arcade. I was optimistic about the title. Would the enhancements change the core game for the worse? Or will they make it better? Hit the break to find out in our full review. A worn keyboard with a sludge-filled arrow key, swampy but responsive... An optical mouse with a scaly and slick, almost snakelike, mouse pad... An archaic OS with accompanying visual tree, bursting with brilliant blues and dazzling reds... These are the tools I used when I played Secret of Monkey Island the first time. And I loved it. Learned from it. Wished it would never end. Now, here I am, playing Secret of Monkey Island: Special Edition with an ergonomic controller, watching the action unfold with an expensive television set roughly the width of my ragged, ancient computer desk. I can recline. I can lie down. And I still love it. I still wish the experience would never end. What strikes me as special about Secret of Monkey Island: Special Edition isn’t the HD visual quality or widescreen capability. Nor is it the new voice-overs, interface or hand-drawn art. None of the new bells and whistles impress me as much as the sheer faithfulness of the port, the obvious attention paid to the fine detail. Secret of Monkey Island: Special Edition is Secret of Monkey Island: Floppy Disk or CD-ROM Edition. It is more dated than it is fresh, and my experience was better in spite of it. The new additions -- that is, what makes the Special Edition special -- don’t alter the core game for better or worse. They are garnish on an otherwise delectable dish. 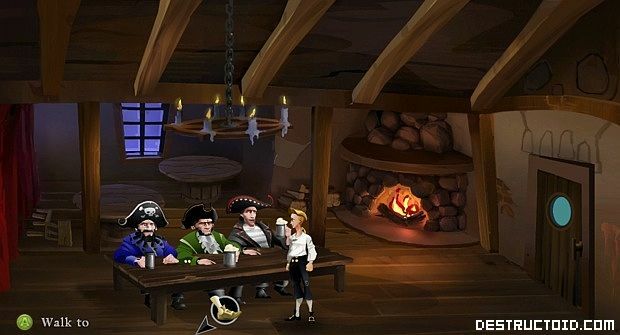 Secret of Monkey Island is an accessible point-and-click adventure title with genuine wit, a heaping of tacky humor and more than a few intelligent puzzles. In the game, you are Guybrush Threepwood, a simpleton who sets out on a mission to become a mighty pirate: the kind of man with a single eye and a knotty leg. The story starts small, but quickly mutates into an epic quest as Guybrush stumbles into Elaine Marley’s clutches and crosses the evil-undead-voodoo-cursed pirate LeChuck. You may remember all of this from, say, nineteen years ago when you played the game with a cheap optical mouse and a keyboard with a swampy arrow key. So, let’s talk about main four new components: art, interface, music and voice-overs. The new art is tasteful and solidly adheres to the original artists’ vision. Aside from the addition of atmospheric touches -- fluffy clouds, hulking ships, lush jungle foliage -- nothing has been critically altered. It feels like, oddly enough, that you’re playing Secret of Monkey Island, not an enhanced version. It’s a mark of perfection. You can stare and play with the old visuals at any time with a button press. A new inventory system and verb system were created for the Special Edition. Both are drop-down menus that require the use of a cursor. It’s an intuitive system, but not a streamlined one, especially when navigating with a controller. Combining items becomes a pain. The action, usually a timed affair, requires the use of two different drop-down menus. It can get messy. 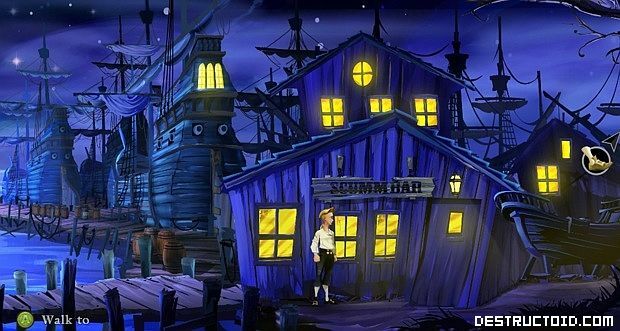 Secret of Monkey Island suffers from a variety of genre-specific issues. Most findable quest items are strewn about the game’s landscape, carefully nestled in the most illogical corners. Most characters don’t guide you to the next task or share locations of important places -- these things are left up to you to discover. And it may take some time to figure out a puzzle. You need to use the universe’s logic, not your own. The Special Edition does tackle these issues, but not with a fix. It addresses them with a context-sensitive band-aid. By pressing a button, the game will give up to three tiers of hints. The last tier reveals a massive yellow arrow and the complete answer to whatever you’re currently doing. Secret of Monkey Island: Special Edition’s upgrades and enhancements don’t change or otherwise spoil the core game (unless you like using hints). For me, this was the most important thing LucasArts could have done. Memories of Secret of Money Island are cemented in my brain, and my original experience with the title is intertwined with my gamer soul. This is an incredibly special game already -- a benchmark for future adventure titles -- made even more special for the current-generation player with new art, UI, sound, and voice acting. Don’t miss this.